Air pollution control and emission control is now being critical in high growth areas of Cement, Chemicals, Pharmaceuticals, Textiles, , Plastics, Power Generation, Steel and other industrial fields. We fabricate a wide range of High Temperature Filter Bags for any application and any OEM style bag house. We have developed wide range of High Temperature Filter Bags for product recovery and dust filtration for these industries. Our vast experience in the line of filtration has made us capable of producing High Temperature Filter Bags for all types of bag houses such as Reverse air, Pulse Jet and Mechanical Shaker. We provide different types of High Temperature Filter Bags as Ring Top, Snap Top, Raw Top, Beaded Cuff Top, Pocket Top, Open Top, Strap Top, Collar Type, Wear Cuff Type, and other types. 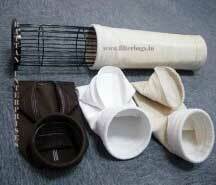 We manufacture these High Temperature Filter Bags on imported sophisticated machines. High Temperature Filter Bags are sewn after accurately cut fabric with thermo / laser cutters and using high temperature resistant thread, which gives very strong and leak proof durable seam. We have professional and technically trained staff, capable of offering virtually any style, configuration, size to meet parameters of exact specification and application requirement.